Como ya os habréis dado cuenta muchos, últimamente no escribo demasiado por aquí y es que últimamente ando con mucho estrés por el trabajo y casi no tengo tiempo libre, pero he decidido poner remedio a esto y para ello he encontrado una página web en donde puedo crear sonidos relajantes para que el demonio del estrés abandone mi cuerpo. 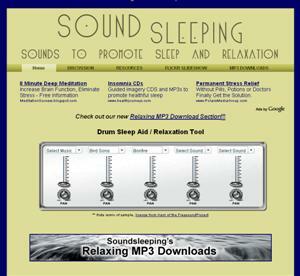 En Soundsleeping.com vamos a encontrarnos con un panel para crear los sonidos relajantes a nuestro gusto. El primer control, en donde pone “select music” nos va a permitir elegir el tipo de música de fondo que queremos (incluso podemos no poner música). Los siguientes 4 controles son para crear distintos sonidos que van desde el piar de unos pájaros, al sonido de una chimenea o bien el sonido del mar o el de una tormenta. Podremos configurar hasta 4 sonidos distintos y podemos ponerles el volumen que queramos a cada uno. Ahora sólo nos quedará quedarnos relajados y pasarnos las horas muertas escuchando esos sonidos tan relajantes, lo único que os recomiendo es que tengáis cuidado con el sonido de la lluvia porque a mí me entran unas ganas terribles de ir al baño, así que he logrado superar mi estrés, pero ahora sufro de incontinencia. Buscaré una página sobre esto a ver que encuentro. Este artículo fue creado el jueves, 8 octubre 2009 a las 9:50 am	y esta en las categorias: curiosidades, ocio / t.libre, salud / medicina. Valora en Bitacoras.com: Como ya os habréis dado cuenta muchos, últimamente no escribo demasiado por aquí y es que últimamente ando con mucho estrés por el trabajo y casi no tengo tiempo libre, pero he decidido poner remedio a esto y para ello he enc…..
Muy original Nachete, la verdad es que cumple su cometido. Muchisimas gracias Nacho, la verdad es que me viene perfecto para aliviar el estrés. Encuentro el sonido del arrollo el mas relajante de todos pero no puedo descargarmelo sin pagar por el 🙁 . I am an avid music lover who spends most of the day and night ltiesning to music in all different forms and genres from a wide range of sources. I have done quite a bit of this same research you did here just for my own ltiesning pleasure and for my edutainment, since I also like to read about what I’m ltiesning to as well as about its source and audio technology. In all my own research, this list is the best, most comprehensive list I have encountered. Thank you for such a superb job, Thomas!I wanted to add a few comments to yours about a couple of streaming sources, as well as recommend one not on the list that I really enjoy.Grooveshark I agree with you about this being one of my favorite streaming sites. One plus for me that you only touched on by mentioning its social capabilities is the ability to share playlists, just like on 8tracks. Pretty much the same playlist sharing capabilities as 8tracks except the ability to embed it on your website (as far as I know). Reason I like it better than 8tracks is the integration with all other other Grooveshark functions and massive library, so I don’t have to jump around to multiple sites for each feature I want to use.Last.fm Again, things you mention but don’t emphasize that are my favorite aspects of Last.fm. My favorite, even if I never stream a single audio track from Last.fm, is the record it maintains of my own ltiesning habits and favorites. The best part of this is that I can scrobble my ltiesning to Last.fm from most of my music sources from my desktop audio players (I use more than one), so I pick up my ltiesning to my own digital audio library, and from Shoutcast and Icecast radio stations; from Grooveshark; and others. Result I can view the stats of my own ltiesning habits over the past week, month, year, etc,, including my favorite artists and tracks. I have VERY diverse musical tastes so it is a real treat to see the diversity of my tastes as well as the artists and genres I like best. Fascinating to see how closely your ltiesning behavior matches what you thought it was. I was surprised by the results, especially that I don’t actually listen to some of my so-called favorites as much as I thought. The other favorite feature is the friends matching feature of the site, that helps me find people with very similar music taste. Other sites offer that too, but what makes Last.fm special in this regards is that I can then see the same very specific ltiesning habits of those friends that the site keeps on me. I have discovered more new music that I really like than through any other single source anywhere. If someone who matches me well listens to tracks or artists a lot that I don’t know, chances are I will like them too. Then I can jump over to Grooveshark and listen to those new artists and tracks instantly before I forget about them.Pandora You mention its recommendation engine – backed by the Music Genome Project – is a very good one. I have a different experience with their recommendation engine. I think it’s quite poor. As a cultural anthropologist I believe its weakness is the Music Genome project. Its a technical approach (via the science of music) to analyzing music. Yet, music appreciation is a highly subjective, personalized HUMAN activity that can’t be analyzed with pure science. It leaves out the human side of music. For example, early on I wanted to have it stream music with female singers only. Impossible on Pandora. Now what could be more basic to ltiesning to music than the gender of the singer(s). Another I’ve tried unsuccessfully to get it to differentiate is between bands/groups and individual artists. Again, it’s impossible! So I quit Pandora very early because of this IMO huge hole in their approach. Great poem Lindsay. I linked to one of your pictures today, not sure if that is one you took or just collect, but great photo. Your site is a great mix of you, your thoughts, and other photos. Keep up the good work. Hiya, I’m truly cheerful I’ve found this info. At present bloggers distribute only on the subject of gossips and obtain and this is really frustrating. A sunny situate with exciting pleased, this is what I penury. Merit for keeping this website, I will live visiting it. Perform you achieve newsletters? Cant stumble on it.